In collaboration with the EU Maltese presidency, the MEP Water Group convened a successful public session on ‘Water Reuse – an effective tool to address water scarcity‘ on the 7th of March at the European Parliament. 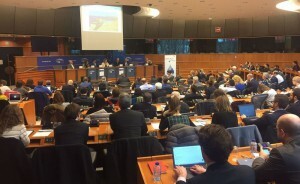 The session was chaired by Esther de Lange, President of the MEP Water Group and hosted five high-level panellists, who presented their own perspectives on why water-reuse is a valuable solution to address water scarcity, adaptation to climate change and implement circular economy. With Malta being the EU member state with the lowest rate of water availability and highest population density rate, Mr Azzopardi, from the office of the Malta Prime Minister and CEO of the Energy and Water Agency stressed out that water reuse, is nowadays a necessary and a key element in Malta’s 2nd River Basin Management Plan (RBMP). He, also, pointed out that advances in technologies are required to effectively develop comprehensive and cost-effective solutions, as well as that support to R&D activities for the development of marketable solutions, together with EU initiatives regulating water reuse, are key elements to ensure investments in the water reuse sector. Ms Doeser, Head of Unit from DG ENVI indicated that the new water reuse directive will aim at preventing uneven regulations from Members States that can create barriers to the market and will introduce a minimum standard at EU level which will ensure that safety and health requirements are met. In fact, “Water reuse is not anymore an alternative supply but the water supply”, continued Mr Gawlik from the EC Joint Research Centre JRC, showing worrying EU maps on water shortage. The water industry “is well aware of the situation and is willing to work closely together with agriculture” ensured Arjan Boogaards from Nalco Water. Mr Van Houtte from IWVA noted that water-reuse is both economically and technically feasible and a solution for water scarcity, as it grants results in sustainable groundwater management and enhances ecosystems. As the last speaker of the session, MEP Dr. Paul Rübig from the EPP Group reminded the audience the importance of fostering investments at the water reuse sector and delivering results at a European level. Before the closure of the panel session, Esther de Lange and Arjan Boogaards emphasised that water reuse would lead to a major community impact, as minimisation of water allows minimisation of energy and waste and therefore reduction of costs. So, it is actually a win-win-win situation. The panel discussion was followed by Q&A from the audience.